Read the revised Supplementary Appeal here. The scale and pace of Afghan returns from Pakistan is accelerating to an unprecedented rate, aggravated by the humanitarian challenges of winter months. Refugees are often returning to areas with limited absorption capacity. Combined with increasing levels of displacement and continuing economic difficulties faced by vulnerable local populations, multiple humanitarian needs are outstripping international capacity to assist. 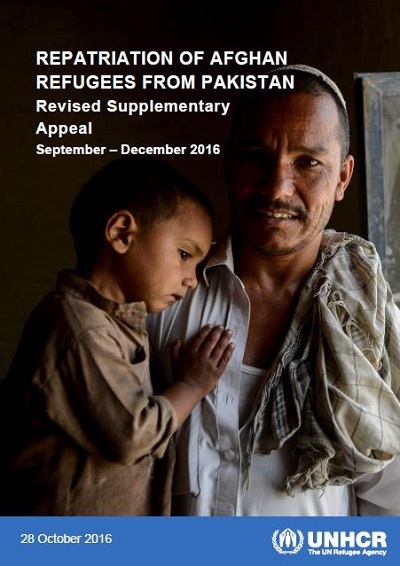 On 19 September 2016 UNHCR issued a Supplementary Appeal for $104.7 million to support 221,000 refugee returnees from Pakistan with repatriation cash grants and enhanced protection monitoring and interventions, as well as processing at the Voluntary Repatriation Centres (VRCs) in Pakistan. Since the publication of that Supplementary Appeal, the pace of repatriation from Pakistan has accelerated, with the added risks of humanitarian impact on already vulnerable people and communities in Afghanistan ahead of winter. This revision to the initial Supplementary Appeal reflects the latest developments, and highlights urgent priority actions that need immediate funding. It reflects increased needs as a result of the increased numbers of refugees returning from Pakistan, and to support the most vulnerable returnees, IDPs and local population in Afghanistan. As of 20 October 2016, almost 270,000 refugees had returned to Afghanistan, almost exclusively from Pakistan. This already surpassed the annual projection presented in the initial Supplementary Appeal. This revised Supplementary Appeal presents the additional financial requirements to support 365,000 refugee returnees and winterization for vulnerable returnees, IDPs and host community population. The revised financial requirements total $181.2 million, up from the $104 million presented in September’s Supplementary Appeal. In light of the exponential pace and volume of returns, UNHCR finds itself critically short of the funding to carry on providing repatriation grants to refugee returnees. To make up for this funding shortfall, it has been re-allocating and reprioritizing resources within Afghanistan and from other operations. Unless further resources are made available, UNHCR will be obliged to suspend the provision of repatriation cash grants in the coming days.